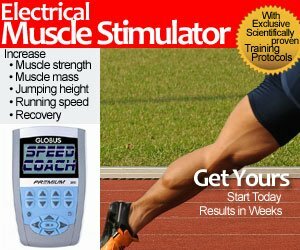 This article was cross posted by Derek Hansen on RunningMechanics.com. Derek and I have our joint site together at StrengthPowerSpeed.com where we sell our online videos and leading edge Globus SpoeedCoach EMS units. On July 1st, I shot some video at the local Harry Jerome Track Classic. It was the 30th anniversary of the meet, held on Canada Day. Watching these events at 120 frames per second is very informative, and highlights both the art and science of movement. After going through the high-speed video from a recent high performance track meet, I decided to compare ground contact times of various events. The video footage was shot at 120 and 240 frames per second and would require manual counting of frames to determine ground contact times. The results are interesting, but not surprising. The shorter and faster the race, the lower the ground contact times. The men’s 100m event yielded ground contact times of 0.091 seconds at approximately the 40 meter mark. I anticipate that that number would be even smaller at 50m and 60m as the athletes reached their top velocity. For jumping events, longer ground contact times are experienced for high jump versus long jump due to the differences in take-off angle and intent (jumping for height versus jumping for distance). The high jump ground contact time at take-off is very similar to the ground contact times for strides in the 1500m. However, the magnitude of force at ground contact is much different for high jump as the athlete is trying to convert horizontal speed into vertical acceleration in an alactic anaerobic event. 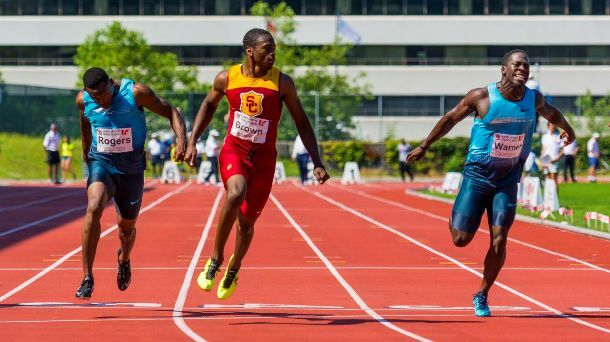 The 1500m are experiencing longer ground contact times because their event requires them to conserve energy and set a pace at a velocity that they can sustain for just under four minutes in an aerobic event. I still say what the foot does while on the ground is more important than the time it spends on the ground.